de Joussineau and Mutlu (2006) and de Joussineau et al. (2007) presented data from sheared joint-based strike-slip faults in Aztec Sandstone exposed at Valley of Fire State Park, Nevada that correlates the length of the longest splay to the length. The authors took measurements from 135 left- and right-lateral faults ranging from 16 cm to 72 m in length throughout three units of the exposures. They identified cases where the propagation of the splays was not perturbed or stopped by any structural obstacle. Accordingly, the splays measured are the longest splays produced by the faults. Figure 1 shows the fault length versus the maximum splay length data plotted in log-log scale. Figure 1a shows that the maximum splay length (msl) is correlated to the parent fault length (pfl) by a nearly linear power law, as shown in Equation 1. Figure 1b shows the frequency distribution of msl to pfl ratio for the same data set. Most of the ratios range from 0.2 to 1 and on average the maximum splay length is equal to 60% of the fault length. Equation 1. Equation for the best fit power law relation of maximum splay length and fault length. From de Joussineau and Mutlu (2006). Figure 1. (a) Relationships between maximum splay length and parent fault length. The best (power) fit to the data is shown. 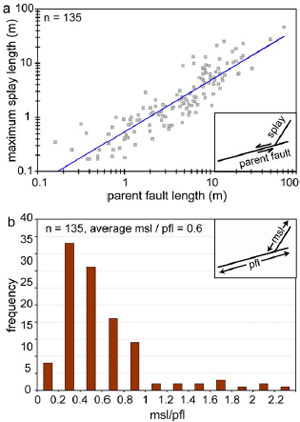 (b) Frequency versus the ratio of maximum splay length (msl) to parent fault length (pfl). From de Joussineau and Mutlu (2006). The maximum splay length does not correlate to the fault slip as strongly as the fault length does where slip can be identified. This is possibly because the maximum slip has not been measured accurately. It may also be due to the mechanism of fault growth by segment linkage which affects the fault slip distribution. de Joussineau, G., Mutlu, O., 2006. Characterization of fault-splay relationships: Field survey and mechanical modeling. Stanford Digital Repository. Available at: http://purl.stanford.edu/bq063hg8985.